I recently picked up this Diamondback Wildwood Tandem off an ad from Craigslist on Tuesday. Team Racer, Joe Solancho and I had discussed entering the Mt Sac Fat Tire Classic XC Race in the Tandem Category. Only problem was we didn’t have a tandem on hand to do the race. So when this Diamondback became available, I jumped on it! 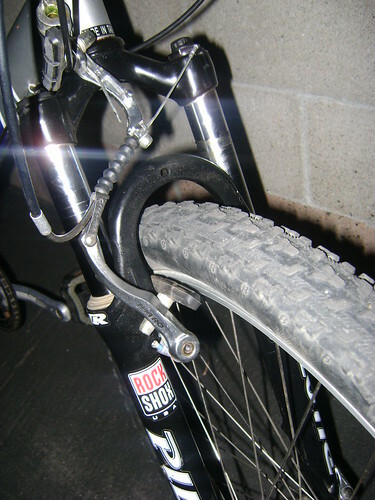 Stock, the tandem came with a rigid fork. But it has a 1 1/8″ head tube, so that meant I could easily swap out the rigid fork for a suspension fork to make our ride a bit more comfy during training and the race. One of our friends, Arnie Alvarado, provided a Rockshox Pilot fork to use until the fork I had placed on order arrives sometime next week. After I installed the fork, one of my buddies, Ben, came over to hang out. 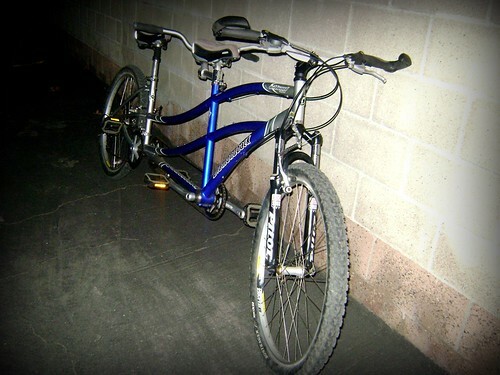 After a couple beers, we decided to test ride the tandem to make sure everything was in working order. As we’re riding around, we decided to race Ben’s son, Joey, he rode an Electric Bike. Ben and I were mashing hard and was leading the race, then as he was applying the front brakes, Ben hears a big snapping sound (he was the captain, and I was the stoker). 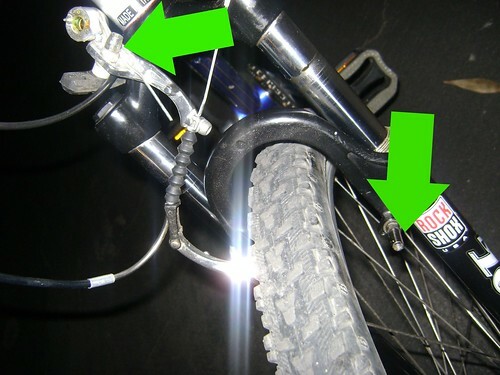 He was able to stop the bike. But upon inspection, we found a mechanical…can you see what it is? So if you are going to be @ the Mt. Sac Fat Tire Classic next week, you may just see us! Right now they don’t have a tandem class, if anything, Joe and I will enter as Beginner Men. But we’re not sure if we should do 27-34(RL-33) or 35-42(Joe-40? )…either way we’ll have fun while mashing the competition.